Begin with an MB867 bisque bauble. Moisten a sponge and wipe bisque to remove dirt. On the DSS-0157 Under the Sea screen, locate the seahorse. Draw an outline around it in permanent marker. Cut it out with the excess screen around the edges. Place the seahorse towards the right of the ornament. While holding it firmly in place, take a small amount of premixed Silkscreen Medium, and gently rub in circles starting in the center and working outward. Slowly pull up the screen to avoid smearing. 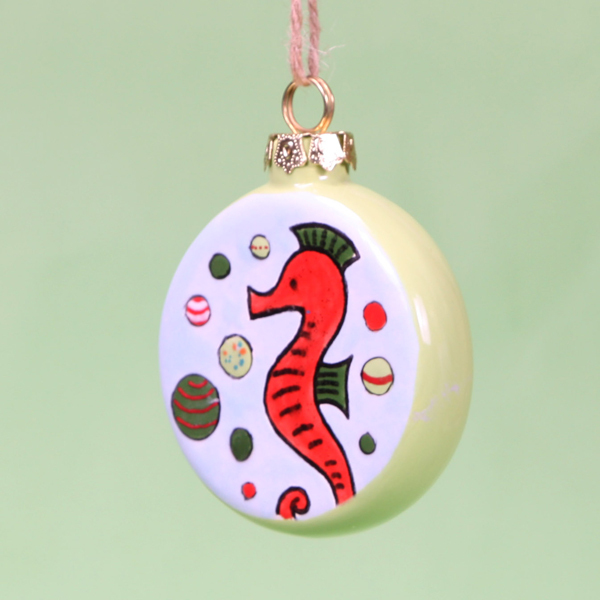 Using the pencil, draw different sized ornaments around the seahorse. Refer to image. Using the Detail Liner with SC-8 Just Froggy, apply two coats to four of the ornaments and the fins of the seahorse. Allow glaze to dry between coats. Using the Detail Liner with SC-73 Candy Apple Red, apply two coats to three of the ornaments and the body of the seahorse. Allow glaze to dry between coats. Using the Detail Liner and Script Liner with SC-45 My Blue Heaven, apply two coats to the background of the ornament. Allow glaze to dry between coats. Using the Scrip Liner and Fan Brush with SC-78 Lime Light, apply two coats to the sides and back of the ornament. Using the Detail Liner, apply two coats to three of the ornaments. Allow glaze to dry between coats. Using the Detail Liner and Script Liner with SC-45 My Blue Heaven, apply two coats to the background. Allow glaze to dry between coats. Using the Scrip Liner with SG-701 Star Dust, apply one coat over the body of the seahorse. Using the Detail Liner with SC-15 Tuxedo, outline the ornaments. Use SG-403 Red, SG-402 White and SG-702 Celebration to decorate the ornaments. Refer to the image.